Landscape Contractor Blue Bell, Pa.
Ingram lawn & Garden is a local landscape contractor specializing in service to Blue Bell, Pa and surrounding towns. Our job is simple, we maintain complete landscapes which include the landscape gardens and the lawn. Our weekly service includes: lawn cutting, landscape weeding, hardwood mulch, edging, pruning and shaping of trees and shrubs, annual lawn application programs, complete lawn restoration, core lawn aeration, over-seeding, spring and fall cleanups, leaf removal, mosquito and tick spraying, replace or restore landscapes or just about anything else related to complete lawn and landscape property management. We do whatever is needed weekly to insure your lawn and landscape continues to look its best. We service customers in Blue Bell, Pa. daily. We also service surrounding towns in: Ambler, North Wales, Lafayette Hills, Wyndmoor, Oreland, Fort Washington, Maple Glen and Dresher. We cannot service every street in each of these towns depending on the size of the street and location to our existing customers. We are fair, honest and professional. We arrive in uniform each week and complete whatever task is needed to insure your lawn and landscape is ready for use when you arrive home. We have an extensive list of references or often you will just simply one of our trucks in your neighborhood. We provide monthly online detailed invoices for the work preformed that month and may of our customers just pay us online. If your looking for a solid landscape contractor in Blue Bell, Pa. to manage your lawn and landscape property give us a call. You will meet with Marty and K.C. 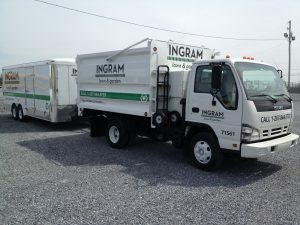 Ingram who own and operate the family business. We will meet and discuss your needs and set your expectations. Our job is pretty simple. We maintain lawn and landscapes so that our customers can enjoy their property with family and friends. Ingram Lawn & Garden your local Blue Bell, Pa. landscape contractor. Here is what we do not do: we do not cleanout gutters or do snow removal. Both of those services require different insurance coverages and skill sets. We are a complete lawn service and landscape contractor that specializes in property management in Blue Bell, Pa. and the surrounding towns of Lafayette Hill, Ambler, North Wales, Wyndmoor, Fort Washington, Dresher, Maple Glen, Pa. and a few others. Call Ingram Lawn & Garden and we will walk your property with you and discuss your specific needs and program. We do not use contracts. We just let our weekly work speak for itself.